Traditionally, we start to learn Tai Ji Weapons after learning and practicing Tai Ji Quan hand form. 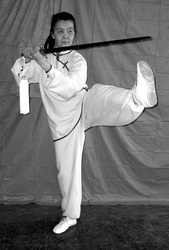 One of the common weapons in Northern Wu Style Tai Ji Quan system is the Sword – a double-edged Chinese Sword. There are certain ways to use the sword technically, and there are 13 basic fundamental techniques need to be leaned at the beginning of practice. These basic sword techniques are within every single movement of the sword form - sometime, there is a single teachnique in one posture, and sometime, there are combination of the techniques in one posture. All these practical sword skills will be described in next paragraph. First, keep in mind, all the principles of studying Tai Ji Quan will be applied to Tai Ji Sword practice! 1. 击: Ji – to hit, or strike. The tip and front part of edge of the sword used to attack the opponent. It can be in variations of angles of a very quick and précised release by the forearm and the power come from the body. It is the basic, most useful, and frequently used technique of the sword. 2. 刺: Ci – to thrust. The tip of the sword straightly thrust quickly to attack the opponent. The blade can be used sometimes horizontal or vertical depend on which part of the opponent’s body is targeted. Sometimes, the double-handed-grip is used for adding more power that mostly come from the body and the legs. 3. 格: Ge – to block with the ridge (flat). This is a common technique to use the ridge of the sword to block the opponent’s weapon. The tip of the sword can be pointed up or down. 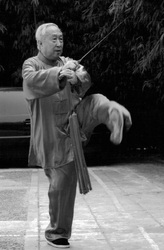 It is a typical Taijiquan skill that stick to (or follow) opponent’s weapon without using a powerful force. It also protect from the attacking weapons by coving your own body as well to prepare for a counterattack. The footwork is very importantly involved in blocking technique, which enable you quickly change the situation. 4. 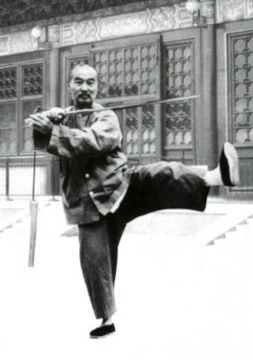 洗: Xi – to clear off The sword tip leads the entire sword continuously vertically circles around the side of the body, and the body follows the sword. It provides the protection to the body in transitions between the movements. With the footwork, it creates both offense and defense techniques. 5. 抽: Chou – to pull or draw along When the edge of the sword touches the opponent’s body, you need continue to pull the sword horizontally to create a cut. It is a useful and clean technique. 6. 提: Ti – to rise up Starting with the tip of the sword facing downward, and palm-outward grip or palm-inward grip both equally used for cutting upward. This technique often used to cut opponent’s wrist, legs, or body from an unexpected angle. This is the technique is focused on training the sword to be used in accurate manner of the forearm and wrist with positioning. 7. 带: Dai – to direct the opponent fall by taking back of the sword. This is a usage of one of the Taijiquan techniques that re-direct the opponent’s movement and his weapon fall into the empty by taking back of the sword without effort. Most of the time, control of the tip, ridge, or edge of the sword, using the forearm and wrist to take the sword straight back from the contact to opponent’s weapon. It is a very good way to defense against the attack. 8. 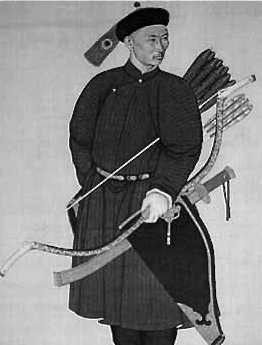 绷: Beng – to explode (fa li) The sword tip usually points upward obliquely and the handle of the sword usually in close to the body position with palm-upward grip in a sudden and powerful motion from the leg and waist to the forearm to strike upward and outward. This technique is developed by taijiquan power training with the whole body release the great force into a target point powerfully. It often used when the opponent gets very close and effectively defense yourself, as well as release a powerful strike. 9. 劈: Pi – to chop The middle part of the sword edge is used to chop down at the opponent with a great force. Normally, the chop is a straight down motion and the central power is used. Sometimes, a slant downward, or a double-handed grip also used for increasing the power. 10. 点: Dian – to point, or pork The force from one’s wrist that cause the tip of the sword strike with a short pointing motion downward and then, lift the tip of the sword upward very quickly. The pointing strike happens very sudden and powerful that goes to one of acupuncture point of the opponent’s face, wrists, or parts of the body accurately and quickly. This is a unique technique that coming from a flexible wrist, which holds the sword in a control and changeable manners. Most of the time, it comes along with a typical martial arts stand or posture come with the supporting to this tiny, but précised action. Do not forget that the pommel of the sword also can do the same thing as “pointing” technique. 11. 绞: Jiao – to make circles When the sword contacts with opponent’s weapon, the tip of the sword leads to make a small circle that make the sword turn over to the other side of the opponent’s weapon, which gives the sword player (fighter) a chance to break opponent’s balance, or redirect their power, or disturb opponent’s original attacking strategy. After making the sword circular, it has to be followed with a powerful strike as the purpose. It develops sensitivity and enables a quick change from a disadvantage moment to dominating of the situation. The sword circling should be in a small, quick, with internal power from the waist, hips, and footwork is a necessary follow-up to make the transition to the next action successful. 12. 压: Ya – to press down The ridge (flat) of the sword is used to press down opponent’s weapon that gives you a certain control. The palm-up grip, palm-down grip, and double-handed grip can all be used with internal force for a powerful pressing depend on the angles of the pressing you wanted it to be. However, holding the press too long is not a good idea in sword fighting, rather than temporarily use the pressing for changing to next technique. 13. 截: Jie - to intercept with the edge This involves a defend technique by using any section of the edge of the sword. When the opponent’s frontal attack towards you and gets closer to you, you dodge, or step sideway to avoid this coming attacking, then, intercept to your opponent waists, arms or body. The technique of the usage of the edge of the sword is not for blocking the opponent’s weapons; it is for cutting the bodies. The concept of intercept” is taking the opportunity and a quick reaction after your opponent committed to his offensive move, also can be understand as you launch later than your opponent does, but you can attack him earlier than he does to you. This very high-level defense technique requires a very concentrated mind, extremely sensitivity of the body, and fastest footwork combine with timing and a trained true internal power to success. Any combination techniques are composed based on these thirteen sword techniques. Practice all the techniques develops an improvisational skill that useful in fighting and the ideal goal on the Tai Ji Sword study journey. The 64 posture Northern Wu Style tai Ji Sword form is famous for its grace in motion, strong at its classical techniques, and its unparalleled footwork! Through many hours of solo practice, you will feel comfortable with the sword than before, and your body and mind have a deeper connection with the sword. Meanwhile, you will do well the form, that contends every technique and conditioning training which is needed to further your Tai Ji Quan training, especially, the weapon itself and footwork in Tai Ji Sword is an adding-on to the practice in order to develop the real skills. Through many hours of partner practice, you will experience both offense and defense techniques of the sword. For instance, one person does the attacking, and another person defending him, both using one technique at a time is a way to learn about focus and positioning and practice one specific technique properly. At the very beginning, it is a set-up practice for both offense and defense, eventually it will be beneficial to your over all techniques because the skills have been practiced slowly, precisely, and carefully examined. Later on, more combination of the sword technique will be practiced through partners; speed, timing, and situation controlling will be the main focused. Again, if you never do free sword sparring, you probably never obtain the ability of the sword fighting, you only have a great learning experience. Through Tai Ji Sword study, you will not only experience the beauty of the art, but you and the sword become one unit. Externally, you unite the body and the sword, your movements become more relaxed, nimble, smooth, energetic with a great balance; internally, you unite the mind and the sword, the fighting skill become a refined with control of the Yi in a higher level of the sensitivity and concentration, and most importantly, the freedom of inside!